I strongly recommend reading his short article, it is good. The problem that we have in the government is that it is really hard for us to organize in a way that helps us to compete like a business. We have a million rules, different appropriations and excuses as to why we can’t organize to get onto a path of organizational maturity. But the fundamental problem is that we remain fragmented and isolated. You can pick virtually any organization. 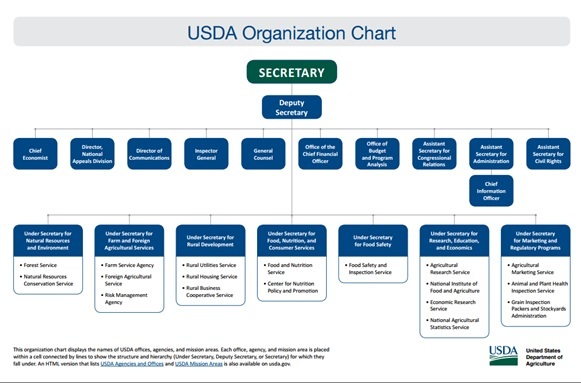 Below is the org chart for the Department of Agriculture (USDA). I picked USDA because they were the first big agency to really get on the path of running the organization like a business. See all of those bullets subordinate to the Under Secretaries? Nearly all of them made separate and independent decisions concerning IT for their bureaus. This led to the Department having nearly 20 email systems. If the Secretary wanted to send a message to everyone in the Department, he couldn’t do it. It would need to be received by key people in each organization and then resent to their people. This was a real daisy chain nightmare. Locally-oriented decision-making is flawed decision-making. I’m not telling you to disregard local requirements. Rather, I’m asking you to think local, but act global. You can write a work statement that builds the application you need, but why would you write it in such a way that people in other bureaus can’t leverage it? You can buy a document management system, but why would you do that when you can spend that money to increase the capacity of the one that another bureau is already using? This is my brand of energy conservation. It takes energy to go out and get a new thing. It takes less energy to better leverage the thing you already have. By 2011 USDA turned this ship around. They only had one email system. They are closing down tons of data centers. They are aggregating their cellphone acquisition and software acquisition. They are leading the effort for everything that we need to do from a commodity management perspective. Thus, if we want the government to function more like a business, we need to start thinking like a business and focus our resources and energy on areas that provide us a competitive advantage. Does email give you a competitive advantage? Does a data center give you a competitive advantage? No. These are commodity capabilities. Things that are commodity capabilities are necessary for the organization, but we should drive them to be as efficient as possible. This seems to be the thinking behind the OMB memo, M-11-29 2, though it would have been more convincing if the order was more thought out. That memo begins with the governance argument, also known as the CIO authorities argument. This is the sentiment that the CIO must have a place on investment review boards (IRBs) to participate in the decision-making process about specific investments. The memo would have been stronger if it would have started with the commodity argument to call out the waste, redundancy, and duplication in commodity IT, and then made the CIO authority argument. We don’t want CIOs to have extra authority so that they can poke their nose in and frick up every single project. Their goal is not to screw up everything. Rather we need CIOs to have this authority because they are often the only people who have the visibility to see the extent of the waste. Using my USDA org chart from the previous page, you can’t expect someone from the Forest Service (FS) to know that the Farm Service Agency (FSA) has data center capacity, or service to mobile devices at a cheaper price or unutilized software licenses. The CIO in FS and the CIO in FSA have visibility across their respective organizations but can’t see into each other’s organization. Only the Departmental CIO has visibility into what is going on within each bureau. That is why we need him or her to have that authority. Moving to the next step of Favaro’s ladder, remember the first step was efficiency, the second step is scale. This is the part I love. Most people can grasp the concept of eliminating duplication and increasing efficiency. But if you really want to attack the cost on commodity capabilities, you need to leverage the scale of the government. Many agencies are already the largest customers for some companies. Think about Army, Navy, and HHS buying computers from Dell. Now imagine if they pooled their acquisitions together, they would be five or six times bigger than the next largest customer. With that size comes a bigger role in managing the relationship.